According to the San Francisco Fire Department, they have suspended recovery efforts for the night and will start again 8 a.m. Saturday morning. SAN FRANCISCO (KGO) -- According to the San Francisco Fire Department, they have suspended recovery efforts for the night and will start again 8 a.m. Saturday morning. Sky7 was over a landslide as emergency crews dug through the massive pile of sand searching for the trapped woman. According to Fire officials, they received a call at 2:30 p.m. Friday for a cliff rescue. When crews arrived they met a group of people frantically trying to dig someone out they said was trapped by the slide. Fire officials announced that they are suspending their search operations and are moving this to a recovery operation. Witness told officials that they saw two women walking a dog about halfway up the cliff when the slide happened. One woman and a dog were rescued-- both suffered non-life threatening injuries. Lt. Jonathan Baxter, with the San Francisco Fire Department, said they are also looking into the possibility that the woman was pushed into the ocean, but they are confident that she did not go into the water. Lt. Jonathan Baxter with the San Francisco Fire Department provides an update on the rescue operation on the beach at Fort Funston. There were 60 firefighters on scene as well as search dogs and cadaver dogs. Bystanders also came to help with rescue efforts. A man who was on his way home, Jaxier Haro, grabbed his shovel and headed down to Fort Funston after getting a notification about the landslide. The slide is covering the beach and responders are right up against the water. Sky Map 7 is showing the distance the landslide fell at Fort Funston that injured one woman and trapping another. 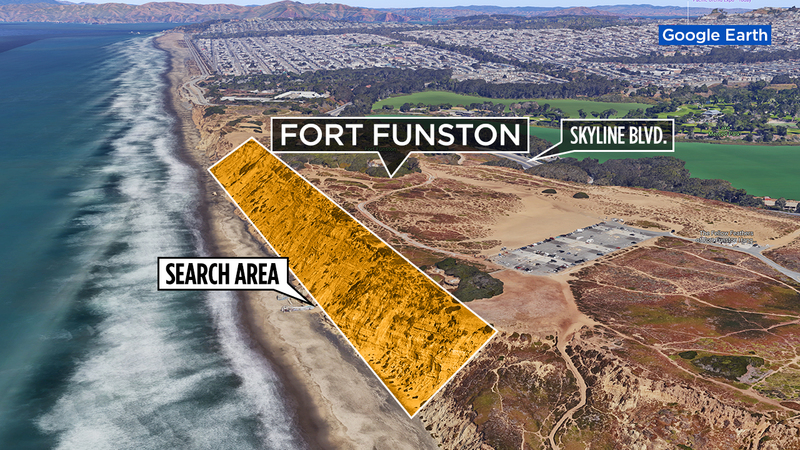 Fort Funston is right off Skyline Boulevard, west of Lake Merced. Google Map of Fort Funston where a partial slide is covering the beach. According to the USGS, there have been rockslides in the past in this area. One in 1989 and another between 2002 and 2010.